Have you added a new addition to your family and need another charm for your Mother's Necklace? 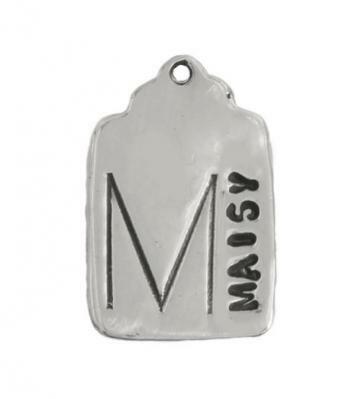 Our stamped silver name charm is just what you need to complete your special piece of mother's jewelry! If you already have our Stamped Tag Necklace and have been blessed with a new addition to your family ~ we can complete your necklace with another charm. The price is for the stamp tag charm. A birthstone crystal can be added for $5. There are two stamping options to choose from. For the vertical option, the large block letter is centered on the left side with a maximum of 7 characters stamped up the right side. For the horizontal option, a block letter will be centered on the top section and the name will be stamped along the bottom with a maximum of 5 characters. This item can be wrapped in our signature lavender and rosebud packaging. So whether it is a gift for you or someone else, the surprise you get when you open the box will make you smile! Proudly, hanging from a chain around my neck, I display THREE silver stamped tag charms depicting my three grandchildren, in the order that they were born. I couldn't be prouder of my granddaddies or my charms!